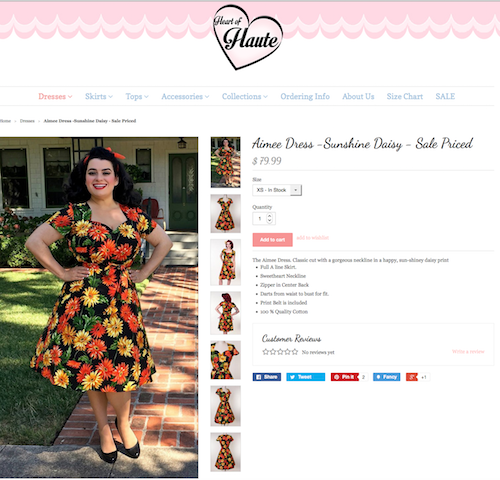 Finally, the perfect Fall Pinup Girl dress is mine!! 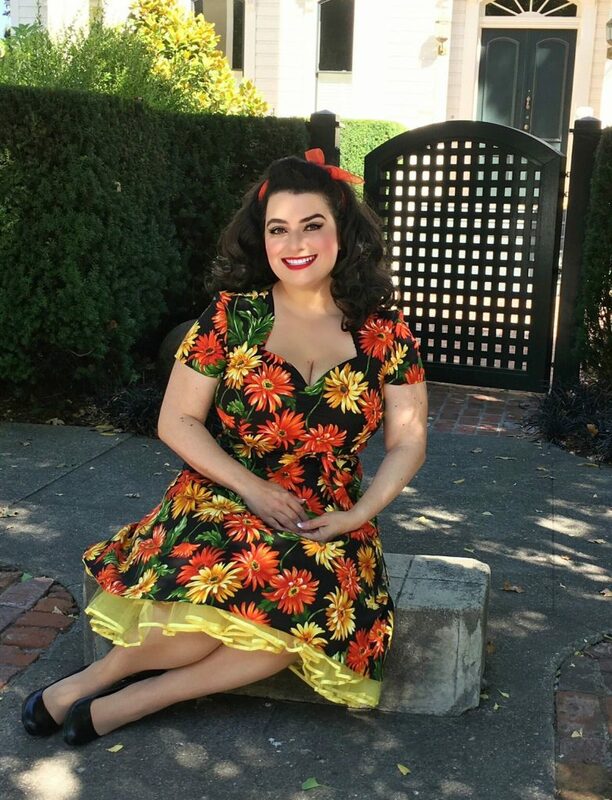 I was so excited when the Aimee Dress in Sunshine Daisy print arrived from Heart of Haute.The print grabbed me right away with those daisies in fabulous pops of bright colors and I immediately knew this would be my go-to Fall dress. The colors are perfect in shades of orange, yellow and green against a black backdrop. I want to call your attention to the cut and style of the Heart of Haute Aimee with its gathered sweetheart bodice, form fitting darts, A line skirt and hidden back zipper that is complete with a matching belt. I absolutely love the way the Heart of Haute Aimee fits my curves, especially my bust giving such a nice shape. I am wearing the Aimee in a size 1X to accommodate my bust and the waist has quite a bit of room so it is very nice the dress comes with an attached tie belt. The dress is 100% cotton and very comfortable. A perfect dress to take you from 9-5pm and 5-9pm. As the weather cools a bit adding a cardigan or a Heart of Haute Sweet Sweater will be perfect and just think of all the color combinations you can do. Heart of Haute makes beautiful clothes and the Aimee is very well done with a feminine silhouette. I want all the Aimee’s, they do come in many different colors and prints. I am so sad to have missed out on the Tulip print Aimee but it sold out so quickly in my size, I won’t be making that mistake again!! Hurry on over to Heart of Haute and get your perfect dress before it sells out! !